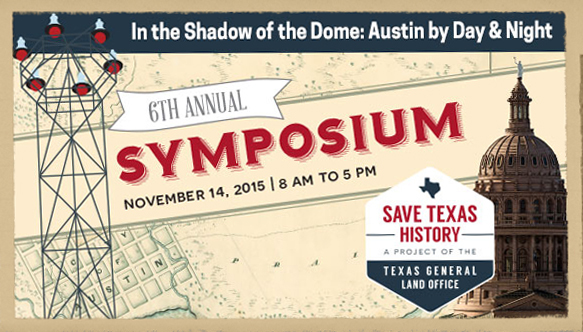 The sixth Annual Save Texas History Symposium will take a look at the history of Austin in a whole new light. In the Shadow of the Dome: Austin by Day & Night will examine diverse aspects of Austin’s history, including the Texas Supreme Court, the destruction of one Capitol Building and the construction of another, and the impact on the city of notable hotelier, George W. Littlefield. It will also delve into some of the less celebrated aspects of Austin’s history. One speaker will examine the Pig War, an obscure dispute that wrought serious diplomatic repercussions for the Republic of Texas. Another will investigate the Servant Girl Annihilator, a serial killer who stalked the streets of Austin in 1884 and 1885. Rounding out the agenda is an exploration of the slave narratives of early Austin, as well as tales from Guy Town. Doug Dukes, retired Austin police lieutenant, Austin history enthusiast and teller of tales of lawmen and outlaws will be giving a talk on the Servant Girl Murders, Saturday afternoon at 1 p.m. Doug will be appearing along with Richard Zelade, author of Guy Town by Gaslight. This entry was posted in Miscellanea & Ephemera. Bookmark the permalink.